Fish Transporters are the agents of commercial fisherman responsible for transporting fish from a fisherman's possession to the point of sale. Fish Transporters are required to ensure that all required information is obtained from the fishermen and recorded on the fish ticket at the point of transfer. The Fish Transporter retains the fish ticket until fish are delivered to a buyer, who will finalize the fish ticket. 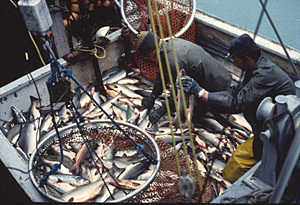 Fish Transporters are permitted in Salmon, Herring, and Pacific Cod fisheries only (see A.S. 16.05.671). A transporter does not have to be licensed in the fishery that they will be transporting and can transport fish from multiple fishermen at the same time. A transporter can be both a licensed commercial fisherman and a transporter. A transporter cannot buy, process, or export fish. Transporters of groundfish should be aware that federal regulations may apply. Call NOAA Fisheries Enforcement at (907) 586-7225 for more information. If you would like to tender other fishery resources, the vessel tendering the fish must act as an agent of the buyer and should be licensed as a Tender/Packer with the Commercial Fisheries Entry Commission. Please call CFEC at (907) 789-6160 for more information. Fish Transporter applications will be accepted through the Department of Revenue's webpage. This will be the fastest and easiest way to have your permit issued. More information can be found at Revenue Online. For assistance with obtaining a DOR letter Id to Enroll in Revenue Online please contact ADF&G at (907) 465-6131 or dfg.seafood-coord@alaska.gov. All Fish Transporter applications need to be accompanied by a $25 permit processing fee, which you can pay using cash, check, or credit card. Please call ADF&G at (907) 465-6131 to provide credit card information or send a completed Method of Payment Form with your application if you do not submit your application electronically with the Department of Revenue. For further details, or if you have questions please contact the Seafood Industry Coordinator at 907-465-6131 or dfg.seafood-coord@alaska.gov.